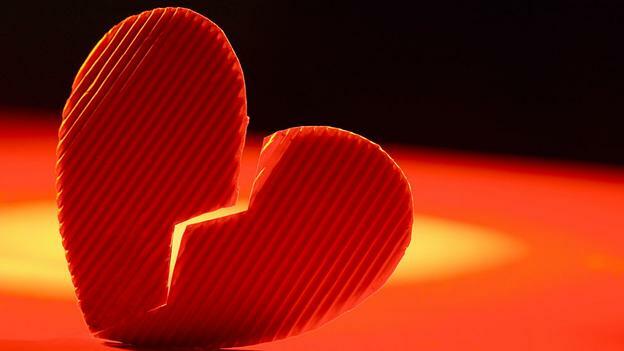 For Valentine’s Day on BRITLAB, Greg Foot and Hannah Fry explain whether you can actually die of a broken heart. BBC – “Love is the drug” sang Roxy Music back in the early 1970s, and it turns out Bryan Ferry and team were on to something. When you fall in love, the same areas of your brain affected by alcohol or drugs like cocaine are activated. They stimulate the part of our brain that seeks rewards. And we become, in a way, addicted to those feelings. In 1986, a 44-year-old woman was admitted to Massachusetts General Hospital. She felt fine all day, but in the afternoon she developed extreme crushing pain in her chest, radiating through her left arm. It’s a classic sign of a heart attack, but the puzzling thing was that she didn’t suffer from coronary heart disesase. There was no life-threatening clot in the arteries surrounding the heart. Despite this, the evidence that extreme emotions can impact the heart goes back decades – only not among humans. It was wildlife biologists and veterinarians who first noticed that extreme emotions can wreak havoc on body physiology. By the mid-20th Century, they noticed that a curious thing happens when an animal experiences a sudden jolt of life-or-death fear. When it’s caught by an advancing predator, adrenaline fills the bloodstream to such an extent that the blood almost becomes like a poison, damaging the animal’s muscles, including the heart. It’s called “capture myopathy”.